ProDessert® allows you to make dessert wines with ease. The most difficult aspect of making dessert wines is stopping the primary fermentation at the desired residual sugar level. 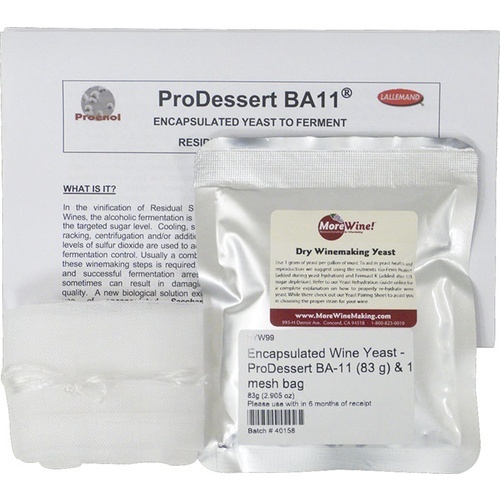 Because ProDessert® yeast are encased in small alginate beads the yeast can be placed in a nylon bag and easily removed whenever you choose. When the yeast is removed the fermentation stops and you retain your desired level of residual sugar. Precautionary measures (e.g. sulfur dioxide additions, chilling and/or filtration) may still be required to completely stop or remove indigenous yeast, although less overall intervention may be needed. For example, the need for large sulfur dioxide additions or drastic tank chilling may be greatly reduced. this made a fantastic ice wine last year, easy to use, convenient, but pricey. worth the price. Great tool for stopping fermentation. Pulled out at 70g/l and wine finished at 50g/l after 30 days at 45 degrees. Wished bags were not as long so it would stay off bottom of smaller fermenters.